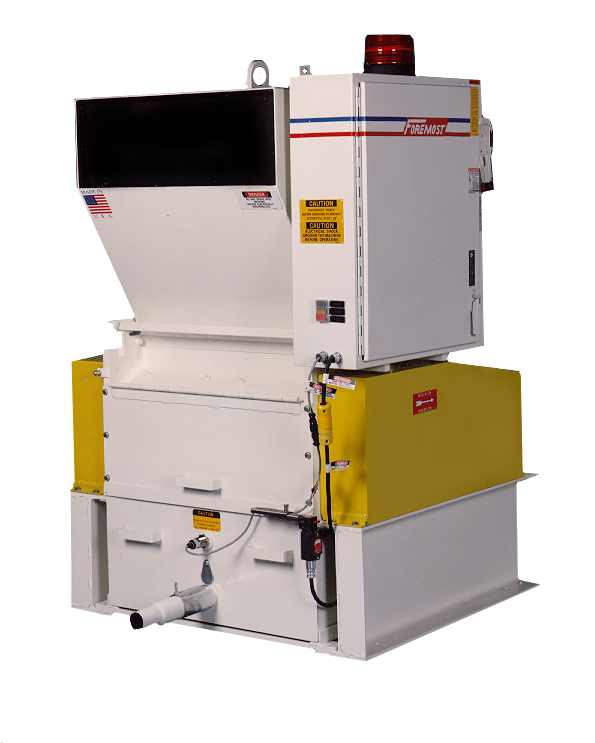 Heavy Duty Granulators HD-4A – Foremost Machine Builders, Inc. The rotor is a solid steel casting, and is offset in the cutting chamber to minimize flyback and noise, while ensuring positive cutting of large or bulky rejects from any thermoplastic materials. Heavy duty, flange mounted, self aligning ball bearings easily absorb all grinding shock insuring long maintenance free operation. The cutting chamber itself is free of any steps or irregularities, providing the utmost in ease of cleaning. The scrap bin slides on guides, and is locked in place eliminating leaking or accidental spilling of the ground scrap material. All hoppers are reversible so that scrap can be fed to either the front or the back of the grinder, an important feature in locations with space limitations. A wide range of throat sizes and power options insure a Heavy Duty Granulator sized properly for every molding application. The drawing shows the cutting chamber of the Heavy Duty granulator series. Note the extremely rigid mounting of the right angle, self reinforcing type rotary knives. The knives are backed up by a solid steel rotor, so that even the heaviest cutting action exerts no strain on the bolts. This arrangement insures long trouble free operation in the most difficult cutting applications with no possibility of the knives lifting from the rotor or losing their clearance setting. The two bed knives are individually adjustable, and are mounted against heavy steel knife blocks. Knife adjustment is easily accomplished by removing the screen and setting the proper clearance on each bed knife with a feeler gauge. The design of the cutting chamber, with the rotor offset, insures positive feeding of large or bulky parts, and eliminates the tendency of these parts to bounce during cutting. Flyback is minimized and noise level is reduced since the parts are not thrown against the hopper due to the cutting action. The screen is mounted in an almost vertical position which greatly facilitates removal for cleaning.